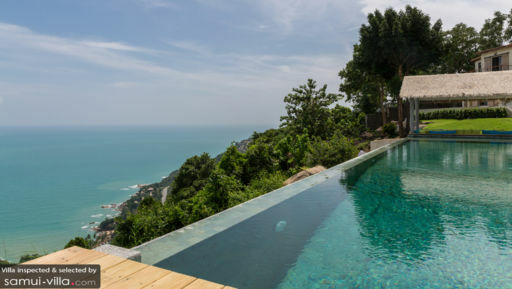 Welcome to the beautiful Villa Koh Koon, a luxurious seven bedroom vacation rental set in Chaweng. Eastern and mediterranean design elements fuse together seamlessly here; you’ll find fixtures like terracotta roof tiles, wrought iron fittings and aged wood shutters throughout the home. The villa is reminiscent of a rustic French farmhouse, but the addition of coconut palms in the lush garden are reminders that you’re residing in the sunny tropics. Seven commodious bedrooms are scattered across four pavilions. In the Mountain View Villa you’ll find two bedrooms - one is furnished with a queen bed, while the other is outfitted with two twin beds. A sun-drenched terrace extends out of each bedroom. The plush Kika Room features a queen bed, as well as a gorgeous en-suite set in a standalone pavilion. Two adjoining rooms are set in the Sea View Villa; this pavilion is best for accommodating families with young children. The fourth pavilion, Alex Villa, houses two bedrooms. The room on the upper floor contains a queen bed, while the child-friendly bedroom below holds four single beds. A spacious infinity pool hangs by the edge of the garden. Set in a prime location, vacation makers taking a dip in the pool will gaze out to a scenic coastal landscape. If you need a respite from the heat of the tropics, simply sink into the pool for an invigorating dip. Loungers and deck chairs line the deck, offering a comfortable seat for avid sunbathers. Amenities like a pool bar, shaded lounge, expansive pool terrace and Bluetooth speakers makes this a perfect venue for a fun-filled pool party. Guests will enjoy lounging in comfort in the cavernous living spaces at Villa Koh Koon. Lofty ceilings, an indoor/outdoor design and muted colours characterise the communal living area. Take a snooze upon the oversized couches, indulge in cocktails by the indoor bar or tuck into a decadent spread at the 18 seater dining table. A pool table, foosball table and dart board adds to the entertainment, and the kitchen is well equipped with Smeg appliances. Villa Koh Koon is a full-service property with five on-site staff. Housekeeping services, personal guest services, airport transfers and a daily breakfast service are included with your stay. A baby cot is available for use free of charge. 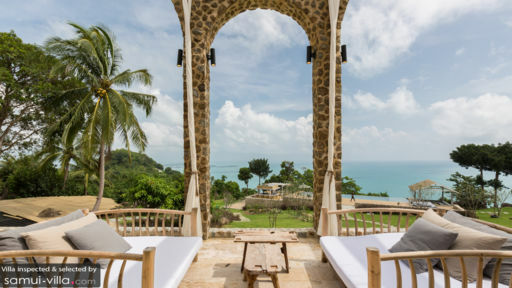 Villa Koh Koon is located in Chaweng, East Samui. Lively and energetic, the east coast is where you’ll find some of the island’s most popular beaches and a vibrant nightlife scene. You’re located an easy drive away from the beaches of Chaweng, Chaweng Noi and Coral Cove. Chaweng Beach, situated 18 minutes’ drive away is known for its vibrant and varied nightlife and dining scene. If you’re seeking out a quieter ambience, head over to Chaweng Noi or Coral Cove Beach. The former boasts a powdery white sand shores and deep waters that are ideal for swimming. At Coral Cove Beach, huge granite rocks framing the coastline makes it a great snorkeling spot. Family-friendly attractions are peppered all around the vicinity. Hang out with friends and families at Lad Koh Viewpoint, where you’ll enjoy incredible sunrise views. The Secret Buddha Garden is great for a leisurely stroll; the grounds offer an unusual collection of statues and uninterrupted vistas out to the verdant tropical surrounds. 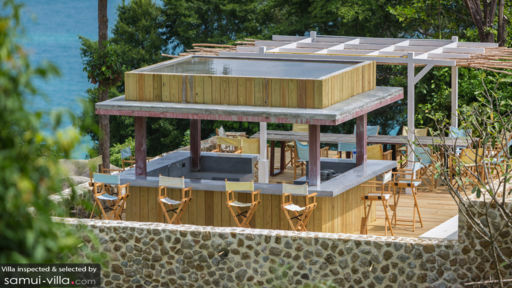 Learn the basics of Thai cooking at Island Organics, a cooking school with an on-site organic farm or stretch out on a yoga mat at The Yogarden Samui. Choose from myriad dining options, which range from relaxed beachfront venues to stylish restos dishing out gourmet European fare. Venues that come with our recommendations include The Larder, Khaw Glong Thai Restaurant, Dr Frogs Bar & Grill, Zama Rooftop Kitchen/Bar and Chef’s Table.